I feel like toners are not given a proper credit when talking about skincare routine. While other parts of the skincare routine, like using a cleanser and a moisturizer, offers instant and visible results, toners usually don’t. This creates an impression that it’s not worth to invest in something that you can skip and, well, basically live without. I too was guilty of this thinking, and while it’s easy to see why, I am very glad I started including this step in my routine. 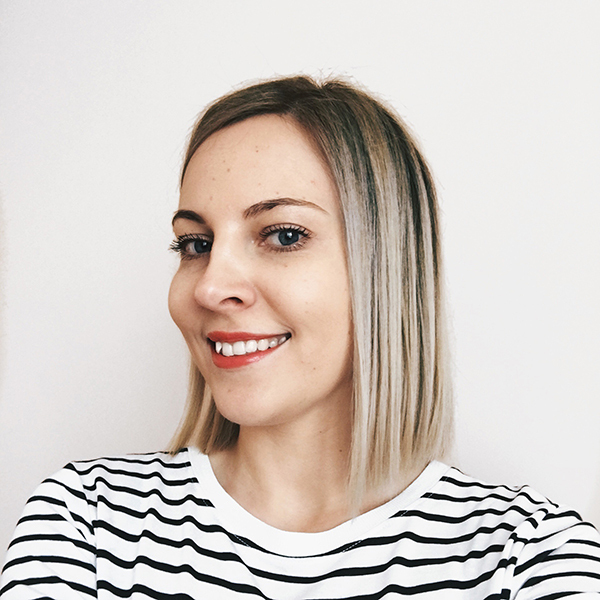 Using toners regularly resulted in my skin looking clearer with less dry patches, and also because I’m trying to use only hydrating and gentle toners, they make my skin softer and help my moisturizer sink into the skin faster. The micellar water hit the markets with a bang a couple of years ago and became one of those cult products everyone talks about. Those who are interested in natural products had to have patience and wait some time until green beauty brands caught up with this hype and started offering natural, plant-based micellar water, but it was worth the wait. There are claims as big as “micellar water saved my skin and my life” coming from bloggers and, although, I’ve been a hands-on skeptic about this type of product when Madara Multi-Action Micellar Water went on sale, my curiosity won, and I placed the order. The packaging of this product is beyond beautiful: a sleek, frosted bottle. The micellar water itself is a clear liquid with a gentle herbal scent. Many articles are covering what exactly is micellar water and why it’s good for your skin so I won’t go into details. In short, micellar water is a no-rinse cleansing water, containing “micelles”. Apparently, “micelles” are molecules that latch onto makeup and other dirt and gently remove it from the skin, leaving it hydrated and soft. I’m neither a scientist, nor a skincare specialist, so I’ll leave the topic of micelles and their miraculous powers to your own judgment, but I’m happy to say that this product works. After I just mentioned that micellar water is a cleansing water, you might wonder why is it included in a post about toners. 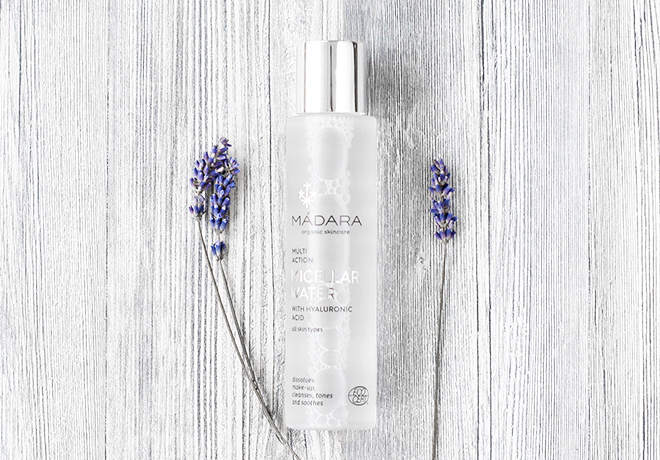 The reason is simple: Madara’s Micellar Water is a multi-action product, which means that not only it removes makeup, but because of its hydrating, soothing, and antioxidant-rich ingredient list, it can also be used as a toner. While for me it doesn’t work as a cleanser alone, I use it after my regular cleanser to freshen up and tone the skin, and it works wonderfully that way. Aloe Barbadensis (Aloe Vera Leaf Juice)*, Rosa Damascena (Rosa) Flower Water*, Hamamelis Virgin Iana (Witch-Hazel) Leaf Water*, Glycerin**, Paeonia Lacti Flora (Peony) Root Extract, Benzyl Alcohol, Caprylic/Capric Glucoside, Sodium PCA, Xylitylglucoside, Propanediol, Potassium Sorbate, Anhydroxlitol, Lactic Acid, Xylitol, Aroma, Sodium Hyaluronate, Phragmites Communis Extract, Poria Cocos Extract, Rhamnose, Glucose, Glucuronic Acid. *Organic. ** Made using organic ingredients. Certified by EcoCert. Vegan, Nut-free. gluten-free. 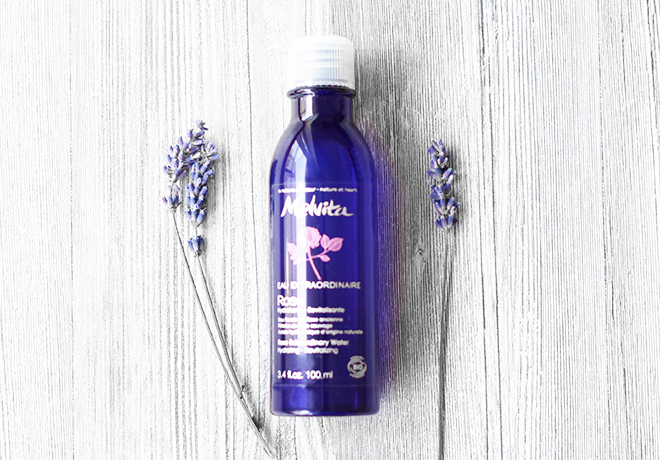 Madara Micellar Water is available at Naturisimo, LoveLula for $17/£14 for 100ml. Melvita is a brand I’m well familiar with. 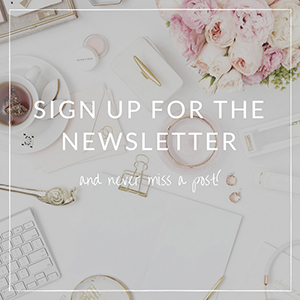 If you haven’t heard about Melvita before, it’s an award-winning French natural and organic beauty brand with a wide range of certified beauty products. I’ve tried a few face creams from its rose range, including Moisture Replenishing Night Nectar and Rose Moisturizing Day Cream, that I liked a lot at the time. This Rose Extraordinary Water, however, is my first flower water from this brand. I like including flower waters in my skincare routine from time to time, and rose water isn’t a novelty to me. I can guess it isn’t to you either. But if it is, you should know that rose water is probably one of the most hydrating, revitalizing, and firming flower waters I’ve ever tried. It leaves the skin feeling firm but comfortable. However, this Rose Extraordinary Water isn’t just rose water. Besides rose flower water, this gel-textured toner contains anti-inflammatory buckbean leaf extract and hyaluronic acid, well known for its hydrating benefits. From looking at the ingredient list, you can easily spot that this toner contains alcohol. I’ve never been afraid of alcohols drying out my skin (something Dr. Hauschka had me convinced is not going to happen), but I am always cautious when a product smells like alcohol. Melvita Extraordinary Water doesn’t smell like alcohol. I’m “team lavender” all the way, but I can not help but notice the lovely rose scent. 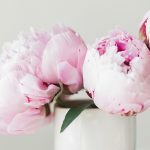 Like most rose waters, this also leaves my skin firm, refreshed, and ready for my next skincare step – moisturizing. Aqua (Water), Rosa Damascena Flower Water*, Glycerin, Alcohol***, Menyanthes Trifoliata Leaf Extract, Rosa Canina Flower Extract*, Rosa Damascena Flower Oil, Hyaluronic Acid, Dehydroxanthan Gum, Levulinic Acid, Decyl Glucoside, Sodium Levulinate, Sodium Benzoate, Parfum/Fragrance, Potassium Sorbate, Geraniol**, Citronellol**, Linalool**, Eugenol**, Farnesol**, Citral**, Limonene**. * Organic. ** Natural components of fragrance. *** Made using organic ingredients. Certified by EcoCert. Vegetarian. Melvita Rose Water is available at Naturisimo for $21/£17 for 100ml. What are your thoughts on toners? Do you have a favorite one? Witch hazel is lovely as a toner! You should try rose water, it’s also wonderful. Thank you, Lauren! Oh yes, the more goodies a toner contains, the better! I love toners and I keep trying out different ones. 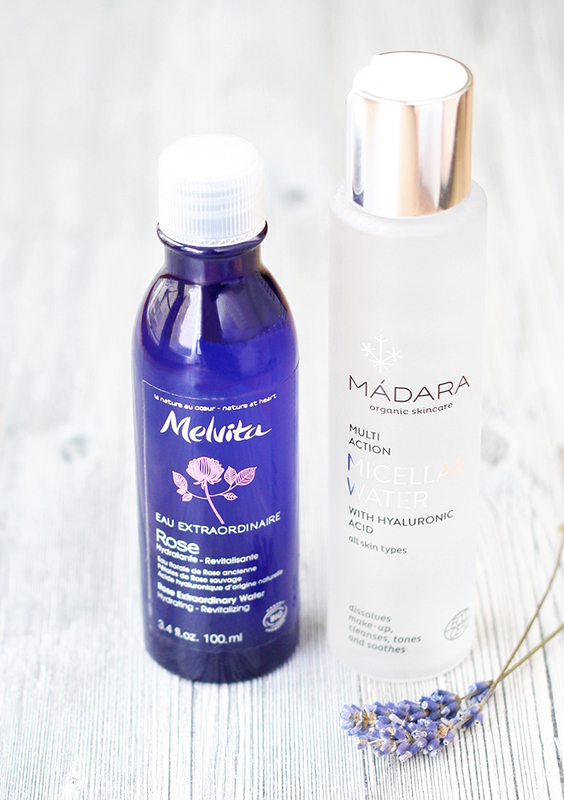 I actually tried Melvita Rose Extraordinary Water and wrote about it here: http://www.behealthynow.co.uk/natural-beauty/melvita-rose-extraordinary-water-review/ It doesn’t work in the same way as normal toners but it’s great for preventing wrinkles. I recently bought Botanicals Mandarin & Chamomile Toner which is one of my favourite toners but I can easily imagine myself buying Melvita Rose Extraordinary Water again. Thank you for sharing, Petra! I absolutely agree that Melvita Extraordinary Water is great for preventing wrinkles. I hope you will, Tianna! That Micellar Water is great!